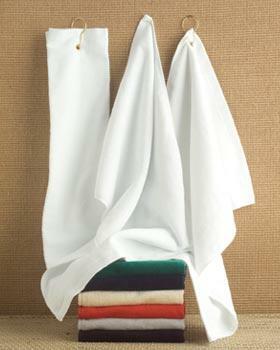 100% Cotton 11" x 18" Hemmed Terry / Velour Towel (1.3 lbs per dozen / 380 gsm). Product Size: 11" x 18" - Hemmed Imprint Area: 8"W x 12"H Packaging Dimensions: 18"(L) X 18"(W) X 16"(H) Units Per Box: 200 Shipping Weight: 27 lbs. 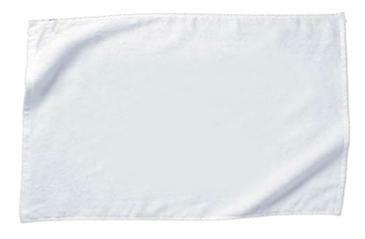 Show your team spirit by waving our new Rally Towel at your team's next game. 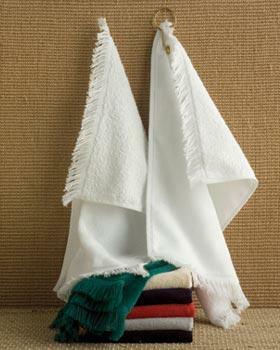 100% cotton hemmed towel. Materials: 100% Cotton Size: 10-5/8"w x 17-5/8"h x 1/16"d Imprint Area: Front (Standard): 7"w x 5"h, 1 color(s) max. 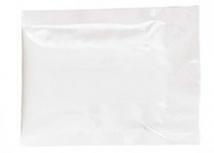 Packaging: Bulk Pack Of: 200 Weight: 20 lbs. 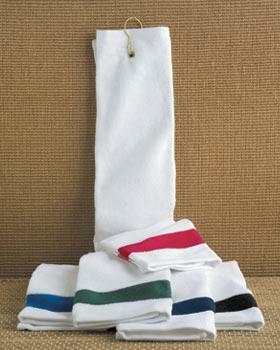 100% Cotton 11" x 18" Hemmed Terry / Velour Towel (1.3 lbs per dozen / 380 gsm) Ships with Clasp asembled. Product Size: 11" x 18" - Hemmed Imprint Area: 8"W x 12"H Packaging Dimensions: 18"(L) X 18"(W) X 16"(H) Units Per Box: 200 Shipping Weight: 30 lbs. A great towel for the gym, it's designed to keep you dry and comfortable. 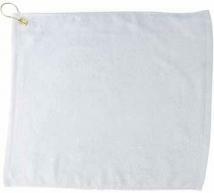 Made from absorbent 100% cotton terry velour. Fringed edges finish the look. Measures 11" x 18", 1.31 lbs/doz. 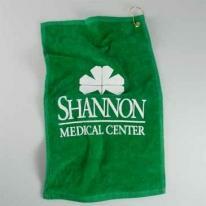 Towel Specialties has both the inventory and printing capabilities to ensure your event's success. 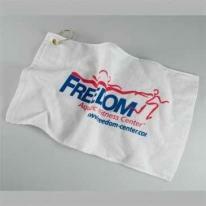 Unlike other low cost promotional towels, ours is manufactured to assure maximum print detail. With our quick turnaround, the CH09 is ideal for any sporting event. Hemmed terry loop. Imprint area: 10" x 12". 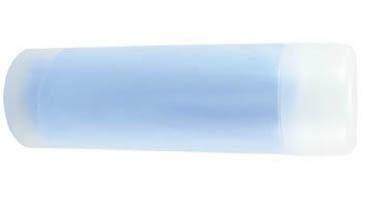 Price includes: For screenprinting, the minimum order quantities per number of imprint colors are: 1 color = 72 pcs. ; 2 colors = 144 pcs. ; 3 colors = 288 pcs. ; 4 colors = 600 pcs. Size: 11" x 17" Weight: 1 lb./doz. 100% cotton one side velour with terry on other side. 2.5 lbs. per dozen approx.T200 Ungrommeted. 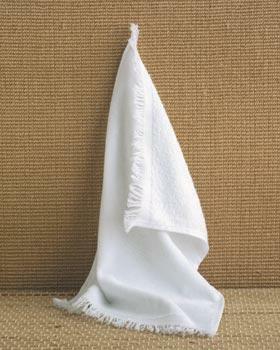 Keep finger tips and golf balls dry with this fringed 100% cotton terry velour towel with grommet and hook. 11" x 18", 1.31 lbs/doz. 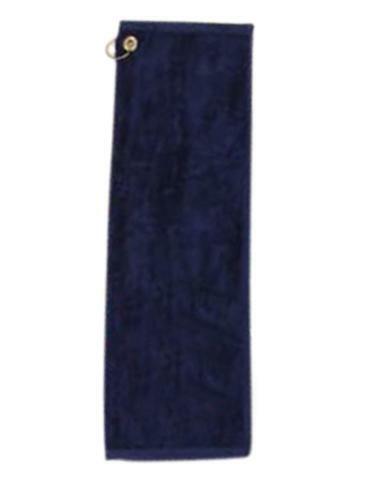 Hemmed terry velour. Approximate imprint area 6" x 8" (front), maximum embroidery area 6 3/4" diameter (front). 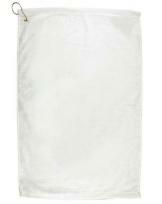 Size: 11" x 18"
Traditionally, the most luxurious towels come from Turkey. And this velour 100% golf towel upholds that legacy of outstanding quality. Crafted to our demanding specifications, with unique features like dobby borders, rolled and sewn side hems and optically brightened white towels. Double-sheared finishing provides extra softness and luster that takes embroidery or Tone on Tone decorating to unsurpassed levels of excellence. Hook and grommet not included in price. Those will add $0.28 per pc. Size: 12\" x 17\" Weight:1.2 lbs./doz Imprint area: 8\" x 10\". 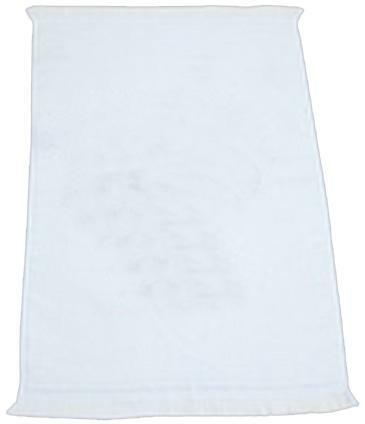 This towel is made from 100% cotton and has a hemmed border. 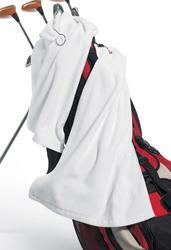 100% cotton hemmed towel Features metal grommet for attaching to golf bag. Material: 100% Cotton Size: 14-3/8"w x 17-7/8"h x 1/16"d Imprint Area: Front (Standard): 7"w x 5"h, 1 color(s) max. 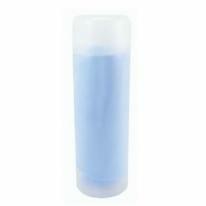 Packaging: Bulk Pack Of: 150 Weight: 20 lbs. 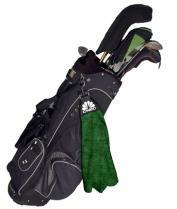 POUCH INCLUDES: GOLF TEES, FIXER, BALL MARKERS & VELCRO CLOSURE. 100% cotton one side velour with terry on other side. 2.5 lbs. per dozen approx. Size: 16 x 25 Min. of 12 pieces per color Must be ordered in increments of 12 pieces. Carabiner style hook can attach towel to golf bag, belt loop, etc. 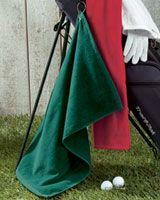 Soft towel conveniently wipes dirt and mud from golf balls and golf clubs. 1 Ply, Specify brass or nickel. 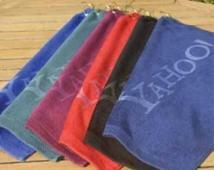 Dimensions: 18.00� H x 10.50� W.
High-quality velour/terry hemmed towel, 1-ply, New Size. Imported, Specify brass or nickel. Dimensions: 18.00� H x 15.00� W.
100% Cotton Velour Hemmed Towel Brass grommet and hook "Soft-hand" silk screened imprint 1.5 lbs. per dozen weight. Actual Size: 15" x 18" Imprint Area: 11" x 15" Packaging: Bulk. Shipping Weight: Due to volume, dimensional weight of 8 lbs. per 50 will be billed. 100% cotton one side velour with terry on other side. Dobby border hem. 3.5 lbs. per dozen approx. Size: 16x25 Min. of 12 pieces per color Must be ordered in quantities of 12. 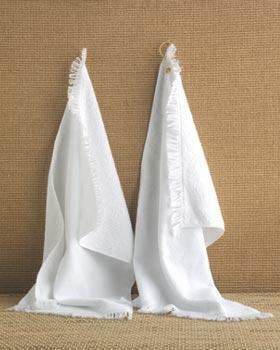 Soft, absorbent velour/terry cotton towels 1-ply; 2.3 lbs. per dozen Great for any type of sport, work, or home use. For grommet, hook, and trifold, add $0.65. Specify brass or nickel. Size: 10.5"W x 18"H Imprint Area: 11"H x 8.5"W Product Weight: 32 lbs. per 288. Carabiner style hook. Actual Size: 17-1/2"h x 11"w. Imprint Area: 12"h x 6"w Packaging: Bulk Shipping Weight: 31 Shipping Quantity: 300. 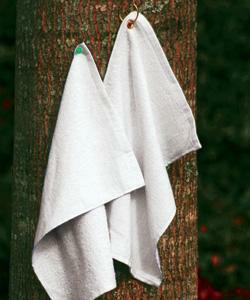 This soft, absorbent towel is always right at your fingertips! 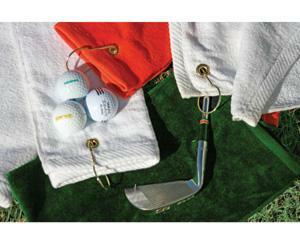 A brass grommet and hook allows the Fingertip to easily attach to golf bags. Made of 100% cotton, 2-ply velour Corner brass grommet and hook Hemmed. Size: 12W x 17L Standard Print Area: Bottom right, 6W x 8H Optional Print Area: Center. 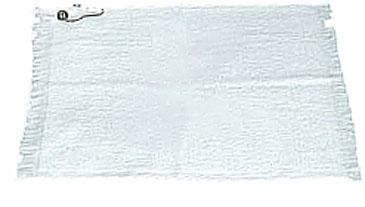 6W x 8H Optional Embroidery Area: Center, 6-3/4 Diam. Packaging: Bulk Package Quantity: 144 Package Weight: 18 lbs. 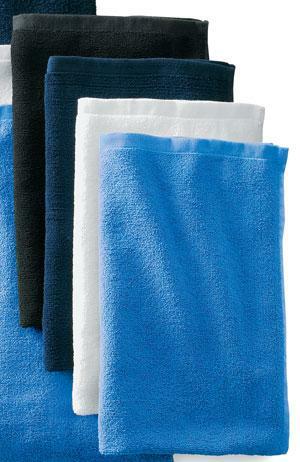 Soft, absorbent velour/terry cotton towels 1-ply; 2.3 lbs. per dozen Great for any type of sport, work, or home use. For grommet, hook, and trifold, add $0.65. Specify brass or nickel. Size: 10.5"W x 18"H Imprint Area: 8.5"W x 11"H Product Weight: 32 lbs. per 288. 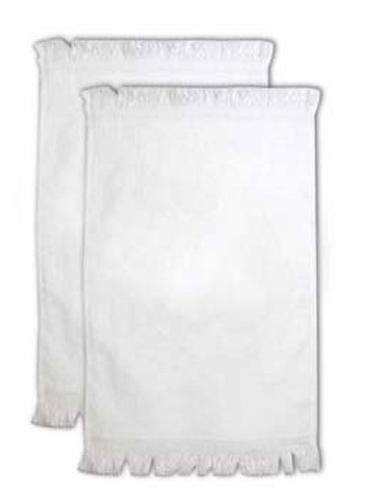 Hemmed 15"x 18" terry 1.25#/dz towel with hook & grommet. 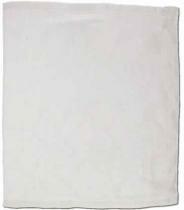 Imprint Size : 10" X 12"
Traditionally, the most luxurious towels come from Turkey. 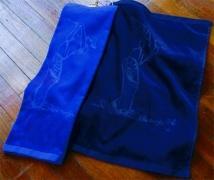 And this velour 100% golf towel upholds that legacy of outstanding quality. Crafted to our demanding specifications, with unique features like dobby borders, rolled and sewn side hems and optically brightened white towels. Double-sheared finishing provides extra softness and luster that takes embroidery or Tone on Tone decorating to unsurpassed levels of excellence. You won't find better quality in a towel this size. Size: 12" x 17" Weight:1.2 lbs./doz. 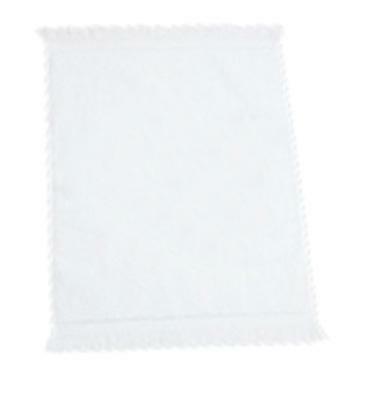 Imprint area: 8" x 10"
High-quality velour/terry hemmed towel White only. For grommet, hook, and trifold, add $0.65 . Specify brass or nickel. 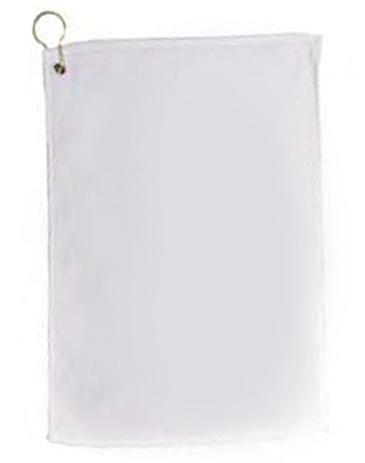 Size: 18"H x 15"W Imprint Area: 13"W x 11"H Product Weight: 58 lbs. per 432. Embroidery is available, please call for details. 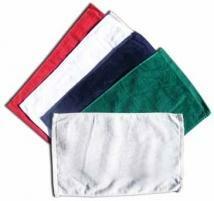 Velour/Terry Sport Towel - Made in USA. 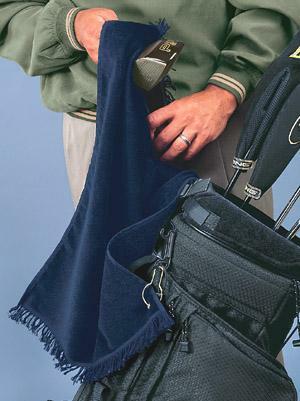 A versatile, hemmed terry velour towel that's well-suited for golf tournaments, the gym and sporting events. 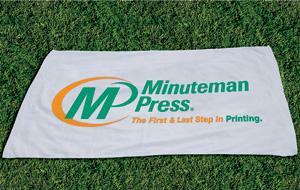 This 100% cotton towel is optically brightened to ensure your screenprinted logo will "pop." Great for tight budgets. Size: 16" x 24". 2.5 lbs./doz. 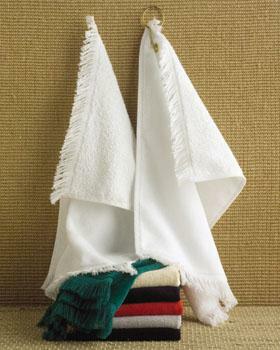 Soft and luxurious, this 100% cotton terry velour towel is fringed for style and features a grommet and hook for convenience. 16" x 26", 2.5 lbs/doz. 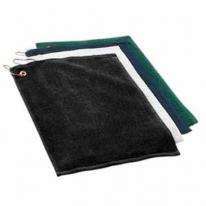 Fringed 11" x 18" velour, 1.25#/dz golf towel with hook and grommet. White only. Imprint Size: 8"X 12" Note: Additional color available, call for pricing. 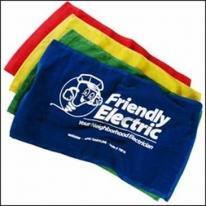 These thoughtful promotional towels are sure to be used and seen repeatedly on the loop. Quality Terrycloth. Custom printed to your specifications. 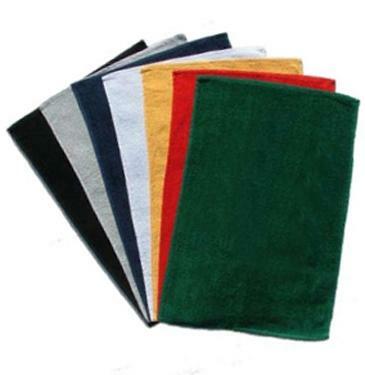 Deep Shear velour hemmed sports towel. Bulk packaging. Size: 12 " W x 16" H. Max Imprint Area: 9" W x 14" H. WT_100: 16 LBS. Paper-Proof: $10. (Required on all labels). 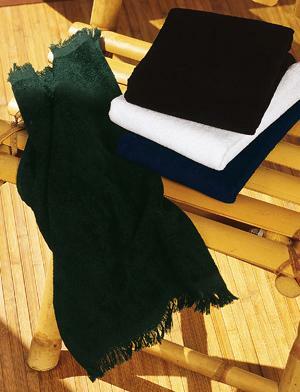 Deluxe-quality velour/terry fringed towel - Made in USA. 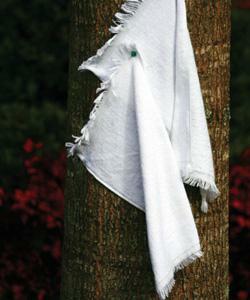 100% Cotton Dobby Hemmed Towel. 1.6 lbs. per dozen weight. 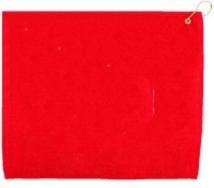 Velour hemmed towel Great fund raiser or school spirit item Weight of 1.5 lbs. per dozen Large imprint area. Actual Size: 15" x 18", can be oriented either horizontally or vertically Imprint Area: 11" x 15" Packaging: Bulk. Shipping Weight: Due to volume, dimensional weight of 19 lbs. per 125 will be billed. 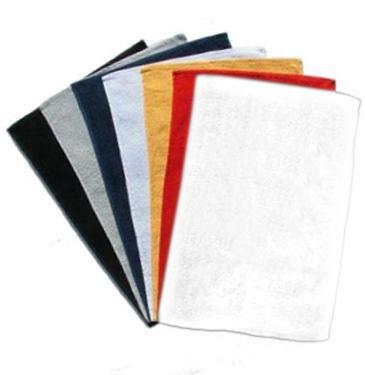 55/45 poly/cotton Microfiber terry, extremely soft and absorbent. Size: 16"w x 26"l, 2.96 lbs/doz. 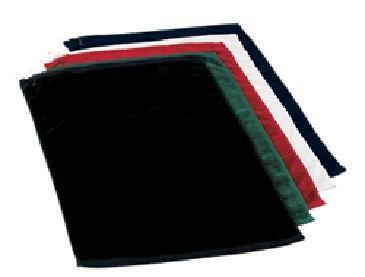 Large Velour/Terry Sport Towel - Imported. 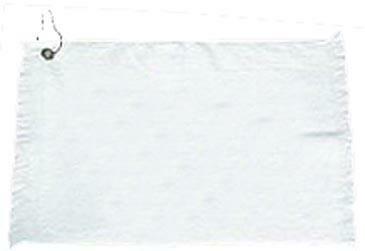 Dimensions: 25.00� H x 15.00� W.
Signature Turkish Heavyweight Golf Towel 16" x 24", 3 lbs./doz. Traditionally, the most luxurious towels come from Turkey. 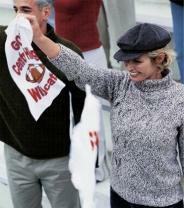 And this velour 100% golf towel upholds that legacy of outstanding quality. Crafted to our demanding specifications, with unique features like dobby borders, rolled and sewn side hems and optically brightened white towels. The CH29 is our best-seller - and for good reason. Size : 16" x 24" Hook and Grommet available at $.28 per towel. Just add that in the notes and we will add it to your order. Note: pricing below is for white towels only and does not include tone on tone pricing. 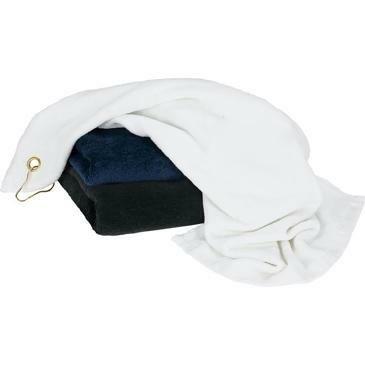 Dobby Velour Hemmed Towel Brass grommet and hook 1.5 lbs. per dozen weight. Actual Size: 15" x 18" Imprint Area: 11" x 15" Packaging: Bulk. Shipping Weight: Due to volume, dimensional weight of 8 lbs. per 50 will be billed. Traditionally, the most luxurious towels come from Turkey. 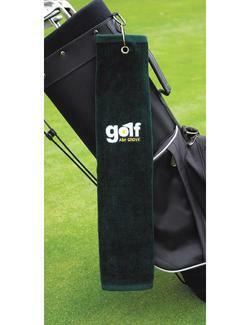 And this velour 100% golf towel upholds that legacy of outstanding quality. Crafted to our demanding specifications, with unique features like dobby borders, rolled and sewn side hems and optically brightened white towels. Double-sheared finishing provides extra softness and luster that takes embroidery or Tone on Tone decorating to unsurpassed levels of excellence. You won't find better quality in a towel this size. 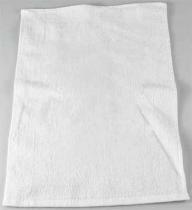 Size: 12" x 17" Note: pricing below is for white towels only and does not include tone on tone pricing. 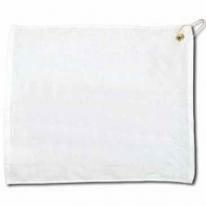 Dimensions: 25.00� H x 16.00� W.
Hemmed 16" x 16" microfiber super soft absorbent towel absorbs 6 times its weight! Provides a streak free finish. White only. Imprint Size: 5"X 5" Note: Additional color available, call for pricing. 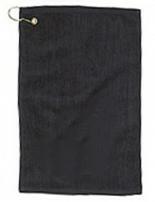 Hemmed 11" x 18" velour, 1.6#/dz golf towel with hook and grommet. Black or navy. 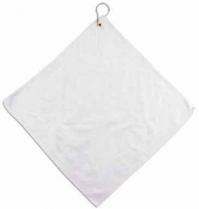 (See G1118W for white towel.) Also available in Silver, Royal, Red, Hunter Green, allow 2-3 Weeks turn. Imprint Size: 8"X 12" Note: Additional color available, call for pricing. 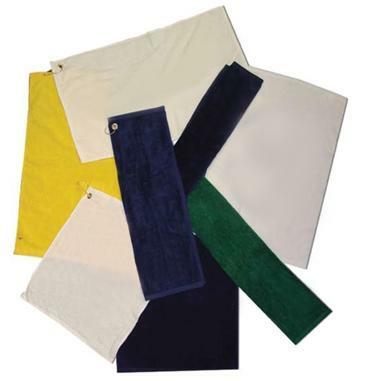 Blue towel absorbs like a sponge, Reuse over and over, Stores in reusable tube, wet or dry, Great around the pool, Machine wash and dry. 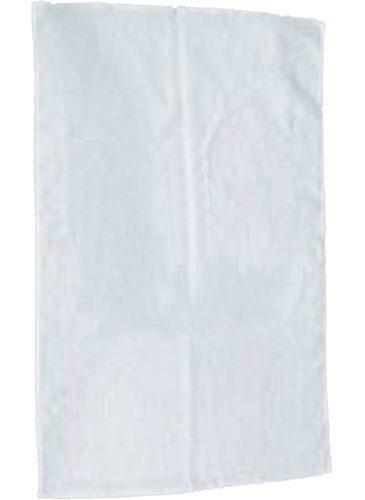 Towel: 14" Width x 21.5" long. 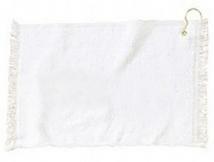 100% Cotton 1-ply towel Brass grommet and hook Hemmed with selvedged edges "Soft-hand" silk screened imprint 2.5 lbs. per dozen weight. 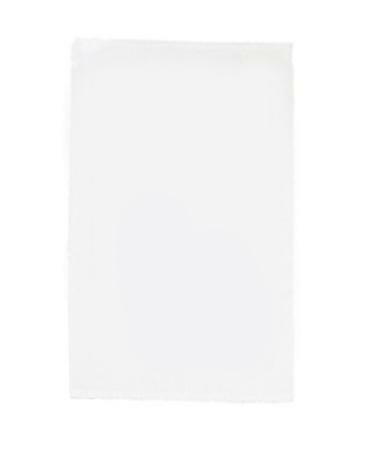 Imprint Area: 16" x 11"; Tri-Fold 16" x 4" Tri-Fold Option: Add $.50 (G) per towel. 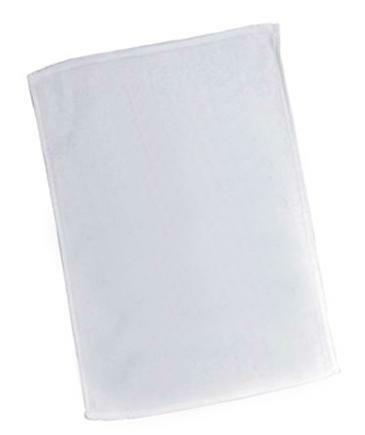 OPTION: Without Hook & Grommet deduct $.15 (G) per towel Packaging: Bulk. Shipping Weight: Due to volume, dimensional weight of 13 lbs. per 50 will be billed. 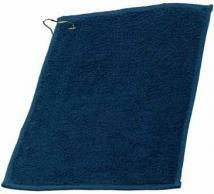 Hemmed 16" x 16" microfiber super soft absorbent towel with hook and grommet absorbs 6 times its weight! Provides a streak free finish. White only. 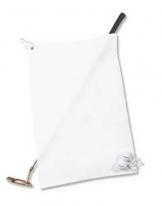 (See GMIC for towel without hook and grommet.) 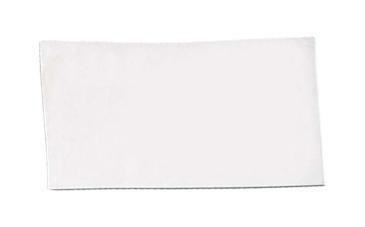 Imprint Areas: Towel 5"w x 5"h Note: Additional color available, call for pricing. Dobby hemmed. Approximate imprint area 4 1/2" x 4 1/2" (front), maximum embroidery area 4 1/2" diameter (front). 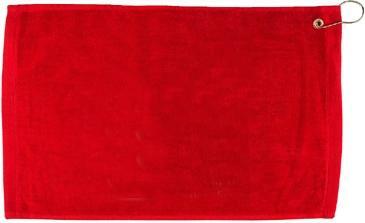 Size : 16" x 26"
High-quality velour/terry fringed towel One-color imprint on velour side. For grommet, hook, and trifold, add $0.65. Specify brass or nickel. 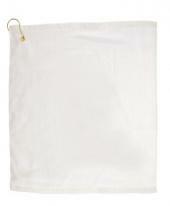 Size: 16"W x 25"H Imprint Area: 15"H x 12"W Product Weight: 48 lbs. per 204. Embroidery is available, please call for details. 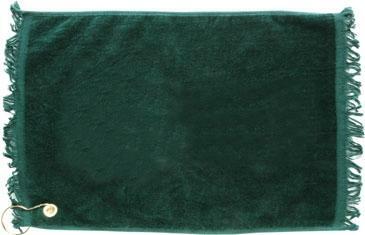 Hemmed Deluxe 2-Ply Velour Towel. Prices Include Grommet & Hook. Other decorating methods available, please call. Size: 11" x 18" - 1.5 Lbs/Dz. 100% cotton, terry loop on both sides.Hemmed ends. Size: 28 x 58 / 7 lb. Per Dz. Approx. Size:12� x 17� Weight:1.2 lbs./doz. Available in: light blue, beige, yellow, grey, pink, navy, black, red, maroon, evergreen, athletic gold, purple and royal blue. 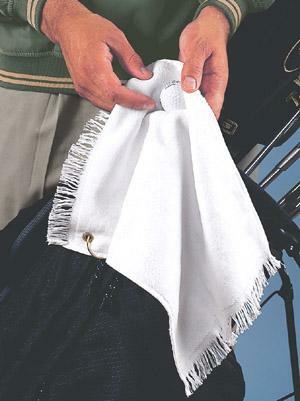 Tone On Tone Turkish Heavyweight Golf Towel Go with Towel Specialties, the industry innovator that first created Tone on Tone decorating on towels. Traditionally, the most luxurious towels come from Turkey. 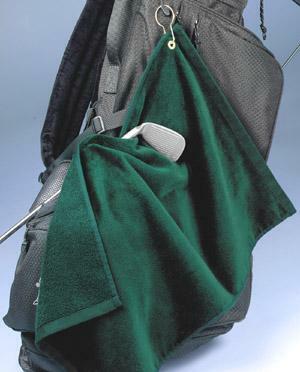 And this velour 100% golf towel upholds that legacy of outstanding quality. Crafted to our demanding specifications, with unique features like dobby borders, rolled and sewn side hems and optically brightened white towels. Double-sheared finishing provides extra softness and luster that takes embroidery or Tone on Tone decorating to unsurpassed levels of excellence. The CH29 is our best-seller - and for good reason. Available in white and14 colors:light blue, beige, fuchsia, turquoise, lime,tangerine, yellow, grey, navy, black, red, maroon, evergreen and royal blue. 16" x 24". 3 lbs./doz.